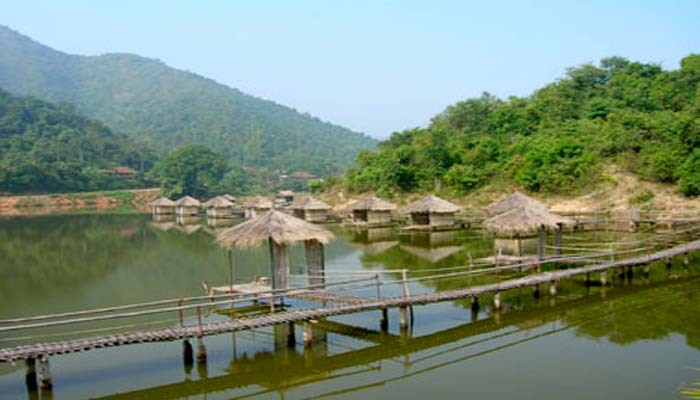 Vietnam tours bring you to many hot spring for health. There are many hot springs in Vietnam tour that you may visit such as Binh Chau Hot Spring in Ba Ria Vung Tau Province, Kim Boi Hot Spring in Hoa Binh Province, Bang Hot Spring in Quang Binh Province. And in the Vietnam tour to Dien Bien Province, you may visit two great hot springs such as Uva Hot Spring and Hua Pe Hot Spring. The hot spring is located in Noong Luong Commune, Dien Bien Town. It is far from Dien Bien center about 15 km to the south west. Uva area is included the hot spring, mountains, lakes, rivers. The area is more than 70.000 m2 in square. The hot spring here is the ideal place for viewing and health. The natural hot spring is in the level of 76-84 C degree. There is the interesting legend related to Uva area. It is told that the area was a place for fairies who had come from the heaven. They came to rest, view the great landscape and help the people who settled in the village. The tour to Uva Hot Spring is included also the time of visiting the village, understand the local culture through the time. The hot spring is located in the location nearer than Uva Hot Spring. Hua Pe Hot Spring is located in Thanh Luong Commune. It is far from Dien Bien Town about 5 km to the north west. The hot water here is in the level of 60 C degree. There is an artificial lake of hot water was built here. It and contributes to the landscape and gives many benefits to people who come to visit and to have the holiday time.